MySpace Friend Adder is the only MySpace friend adder with full desktop functionality. Add friends, send messages, leave comments, send event invites, accept friend requests. Use MySpace Friend Adder on as many MySpace accounts as you'd like - MySpace Friend Adder even includes chaining! Don't pay $20-$80 for other MySpace friend adders when MySpace Friend Adder Open Adder does it all, just download MySpace Friend Adder to have a try Now ! Open Adder will allow you to gather a list of friends you want to add, hit a button, and will do the work for you. It can even bypass image verification on some accounts. Open Adder will never send a friend request to the same person more then once, so you don't have to worry about bombing people with duplicates. You can clear this memory if you choose to, of course. You'll also be able to send a message with your friend request. Once you start using Open Adder to increase your profile's exposure, you'll find yourself getting a lot more friend requests then you used to! And accepting them all can be a pain. That's why Open Adder will automatically accept all your pending friend requests for you, with the touch of a button. Tagged Blaster Pro is the internets best tagged friend adder marketing tool. Capture all MySpace web pages and instant messages instantly. Download and convert MySpace video to the common "avi" format. The internets number #1 Facebook Friend Adder Bot. 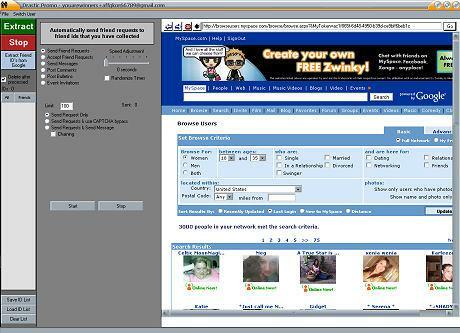 Qweas is providing links to MySpace Friend Adder Open Adder 2010 as a courtesy, and makes no representations regarding MySpace Friend Adder Open Adder or any other applications or any information related thereto. Any questions, complaints or claims regarding this application MySpace Friend Adder Open Adder 2010 must be directed to the appropriate software vendor. You may click the publisher link of MySpace Friend Adder Open Adder on the top of this page to get more details about the vendor.